On the Daily Mail Site there is a selection of Underground photos. Among them is one showing a busker entertaining some people in a "tube" carriage, except the carriage is obviously an ex-LNER buffet car. Some on another forum have asked whether this carriage could have been part of a LT related working, does any one know? Interestingly the end door has a bolt and lock which is not original. Of course it could have been an ordinary publicity shot taken at a main line station. billbedford I tried clicking on the link, but a message came up for a broken URL. Either that or my phone has developed an intolerance for the Daily Mail! 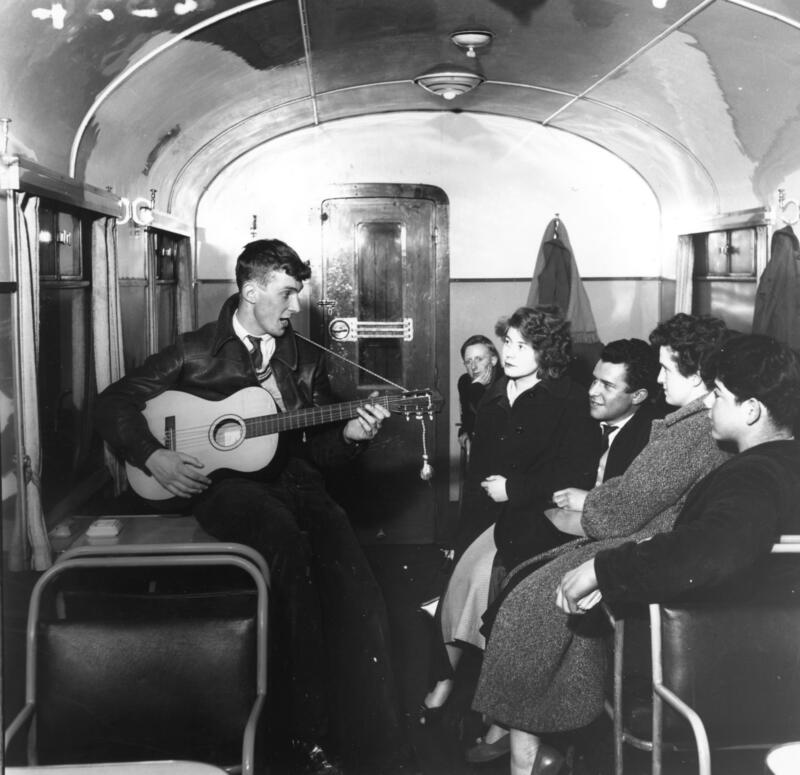 Credit to Getty Images from www.dailymail.co.uk/news/article-6635653/The-changing-face-London-Underground.html captioned "Busker Brian Hinton entertains passenger on this tube train in the 1950s". Cheers toby , Could it be that this was an LNER carriage was part of a service working over the joint lines? There were Buffets on the peak services from Chesham. According to 'Steam to Silver' the Met Pullman services offered light refreshments including breakfast on the Up morning trains (from Verney Junction) and a light supper on late Down trains from Baker Street, to cater for theatre traffic. Yes, but the pullman service was withdrawn during WW2 and not, as far as I know, reinstated afterward. A quick thought on the alleged busker. There was, in 1957, a skiffle group called Jimmy Miller And The Barbecues, who released a record called Sizzling Hot, produced by the legendary Joe Meek. Most of the group worked on the railways & regularly performed at Greenford Station. Unfortunately, I can't find any publicity material on them, but there was a pic on the sleeve notes of the CD Joe Meek The Lost Recordings from 2009, which I once had. Interesting choice of title, given this thread, as was, given this site, another title they did-Freewheelin' Baby.